USF undergraduates collecting data on the FCAEM electron microprobe as part of their GLY 3311C class. A critical element in doing undergraduate research is engaging undergraduates to work with you in research. Very few students have the skills to be successful researchers walking in the door, and few arrive with innate scholarly interests that align with your own. Students need to develop Scientific Habits of the Mind, and they need training in key technical and intellectual skills in order to function as collaborating, contributing scientists. 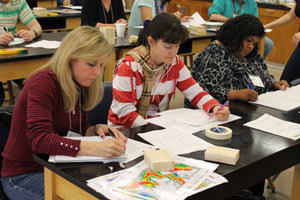 Part of one's job as an educator is to help geoscience students develop these skills, and inciting interest in research, and teaching the skills necessary to be able to carry out geoscience investigations. Thankfully, this is both beneficial to them and useful to you in advancing your research agenda. Here is a compilation of scientific habits of the mind from submissions by the On the Cutting Edge Early Career Faculty workshop participants. Understanding that outcomes that are not prescribed – no "right" answers – such that students must make interpretive decisions and be able to defend their choices. This involves developing students' metacognitive skills. Problem-based Learning activities (PBL) focus on developing similar intellectual skills, but can lack the open-endedness typical of research problems (see an extensive list of references and web resources for PBL). Bringing aspects of your research into your courses, and giving students a "taste" of research through activities that help them develop important technical and investigative skills, is the same thing as building inquiry-based activities into courses (See Guertin, 2007; Balaban, 2007; also see Tewksbury and Macdonald, 2007; and their online Course Design Tutorial discussed in this article) and will help students develop critical thinking skills, both key aspects of best practice in course and curriculum design. The rapid development of informatics resources and tools, and in particular the availability of powerful and user-friendly geospatial information system (GIS) platforms that permit easy data manipulation and visualization, present a range of opportunities for developing research-intensive classroom experiences (see Geocyberinfrastructure Data Resources). These informatics "portals" provide data in formats compatible with popular visualization and data management platforms (ArcGIS, Google Earth and resources on Teaching with Google Earth), and many also provide their own suite of visualization tools to facilitate data manipulation and first-order interpretation. 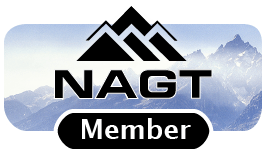 The MARGINS Data in the Classroom project, now ongoing as a core educational activity of the successor NSF GeoPRISMS Program, takes multidisciplinary datasets collected during MARGINS/GeoPRISMS funded research projects and repurpose them for educational use in undergraduate geoscience and ocean science courses. The current MARGINS Mini-Lessons collection includes 34 different activities that make direct use of MARGINS datasets or of visualization products from these data. Many of the Mini-Lessons are built around GeoMapApp, a free map-based GIS platform for the marine environment, that provides easy access to a range of global geophysical and bathymetric datasets, as well as easy linkages to geochemical and geophysical data managed by the Integrated Earth Data Applications facility at Lamont-Doherty Earth Observatory. NASA maintains all its mission data online in public information portals (see the Geocyberinfrastructure Data Resources page in this collection for a full list of recent NASA mission data portals). The School of Earth and Space Exploration at Arizona State University has developed and maintains a map-based "planetary" GIS tools for all recent MARS imagery and observational data called JMARS in which novice users can do basic comparisons among the various Mars global datasets. An alternative access path to the Mars global databases is the "planet" function in Google Earth (see also Google Mars for a "maps' version of these data). 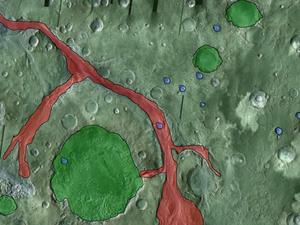 The 2006 Cutting Edge Discoveries from Mars workshop and associated collections includes a range of classroom activities making use of the NASA Mars data collections, including a set of linked image analysis activities that I developed for use in introductory earth/planetary science courses. Using research instrumentation in class activities has long been a part of geoscience instruction (for recent examples see Beane 2004; Peterson et. al 2007; King, 2007). Numerous projects focused on classroom use of instrumentation have been funded by the NSF Instrumentation for Laboratory Improvement (ILI) and by Course, Curriculum and Laboratory Improvement (CCLI) Programs. This has occurred over the past 15+ years, at both small scales (1-2 lab activities in a course) or as part of a comprehensive course revision (see the Research Instrumentation Use in Support of Learning and Research Intensive Courses pages in this collection for further information). Evaluation results from past funded projects show that while students and faculty find benefit in these activities, the logistical challenges of bringing a classroom of students to an instrument and ensuring that everyone benefited from the experience were significant concerns. 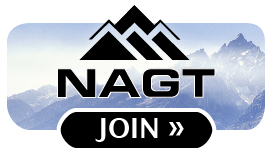 To work around the logistical obstacles, I pursued an alternative approach of integrating remotely operable instrument use into both introductory and upper-level geoscience courses. The instrumentation I use, a scanning electron microscope and electron microprobe instrument housed at the Florida Center for Analytical Electron Microscopy (FCAEM) in Miami, FL, has full remote operational capabilities via free/low cost UNIX terminal emulation software (VNC Viewer). I developed a whole-class activity involving instrument use to familiarize students with the instrumentation and provide some initial training on it, and I can include in labs time for all students to conduct their own measurements without having to leave the classroom. and Concerns. in Karukstis, K, and Elgren, T., ed. :Developing and Sustaining a Research-Supportive Curriculum: A Compendium of Successful Practices. Council on Undergraduate Research, Washington, DC., pp 41-60. 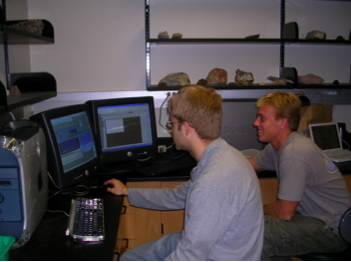 Beane, R., 2004, Using the Scanning Electron Microscope for Discovery Based Learning in Undergraduate Courses. Journal of Geoscience Education, v. 52, pp 250-253. Guertin, L., 2007, Preparing Students for Research at the Introductory-Level 112 with Technology. in Karukstis, K, and Elgren, T., ed. : Developing and Sustaining a Research-Supportive Curriculum: A Compendium of Successful Practices. Council on Undergraduate Research, Washington, DC., p 112. King, E., 2007, Integrating Cathodoluminescence into an Undergraduate Geology Curriculum. Journal of Geoscience Education, vol. 55, pp 426-433. Peterson, V.L., Lord, M.K., and Vandervoort, K, 2007, Establishment of an Investigative Curricular Approach across the Geology and Physics Programs at Western Carolina University and Implementation at Other Institutions. in Karukstis, K, and Elgren, T., ed. :Developing and Sustaining a Research-Supportive Curriculum: A Compendium of Successful Practices. Council on Undergraduate Research, Washington, DC., pp 425-448. Tewksbury, B.J. and Macdonald, R.H., 2007, A Practical Strategy for Designing Effective and Innovative Courses, in Karukstis, K, and Elgren, T., ed. : Developing and Sustaining a Research-Supportive Curriculum: A Compendium of Successful Practices. Council on Undergraduate Research, Washington, DC., pp 127-136.